During the summer months, several Leucadendrons develop beautiful red tones, giving them the appearance of stained glass when they're back-lit. As my photos of these piled up, I decided it might be a good time to take an inventory of my burgeoning collection. Frankly, I couldn't have told you off-hand exactly how many of these plants I have until now. The answer is 19. Unless I've forgotten one here or there, which is entirely possible. I picked up my first Leucadendron, 'Wilson's Wonder', years before we moved to our current location. My former garden was a tiny, shady space behind a townhouse, not at all suitable for this plant. I put it in a large pot in our driveway, one of the few spots we had that received a decent amount of sun. There it stayed until we moved to our current location 7+ years ago, when I finally put it in the ground. This is my original plant, coincidentally assigned a space along the driveway of our current house. It took off as soon as I put it in the ground. 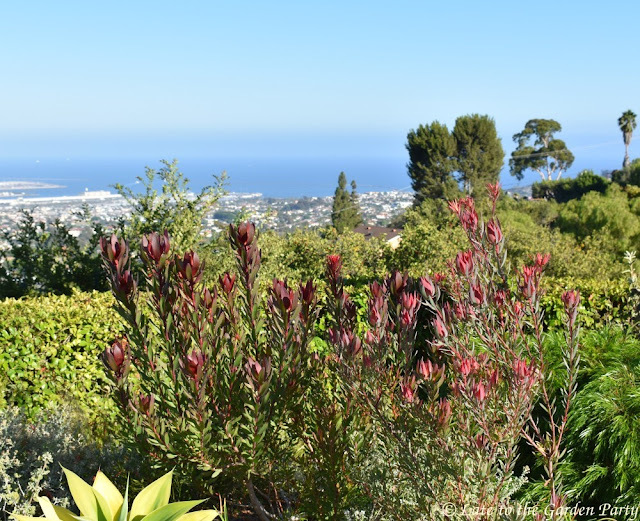 Although I cut it back hard in late winter after it finishes "flowering," it reaches 6 feet or taller during the summer months when the foliage takes on its lovely red hue. I planted this one elsewhere in the front garden in November 2014. It's still smaller than the first but it's working on catching up. Here's a photo of the same plant back in January. Its "flowers" are actually yellow bracts surrounding central cones. The plant has radically different personalities during the winter and summer seasons, doesn't it? 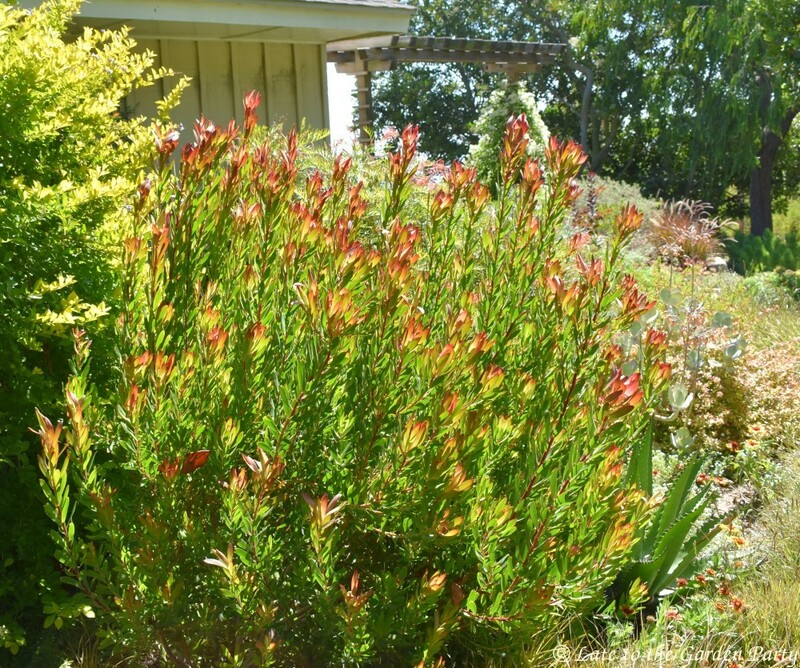 I'm not sure when I planted my first (of 4) Leucadendron 'Devil's Blush', other than that it appears to have been before I started keeping a record. I'm guessing 2011 or 2012. Some were labeled 'Blush' and others not labeled at all so my ID is a guess based on their appearance in some instances. Although a lot of Leucadendrons produce flower-like forms seasonally, those on 'Devil's Blush' produce the most convincing imitation in my view. They make me think of long-stemmed rose buds. In 2013, after clearing the northeast corner of our property of lawn, gravel, and a huge expanse of plastic buried beneath the gravel, apparently intended as a weed barrier, I planted 2 Leucadendrons there too. 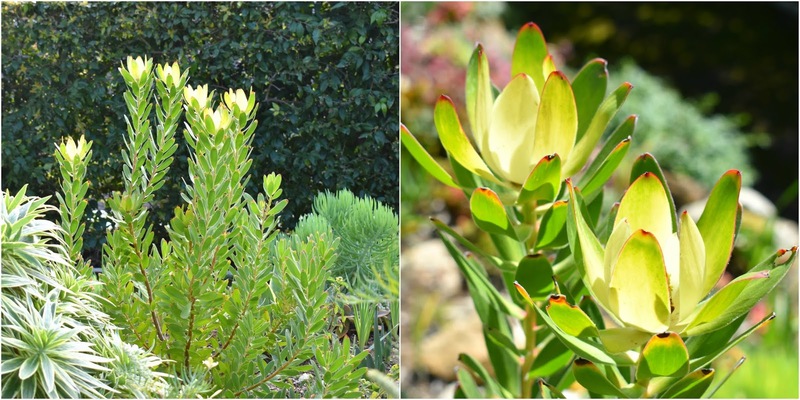 Although Leucadendron salignum 'Chief' is one of my tallest specimens (despite a hard annual pruning in late winter), it isn't as flashy as 'Wilson's Wonder'; however, I use its slender stems in flower arrangements more often than those from any other Leucadendron. Like 'Wilson's Wonder', it produces yellow-tinged "flowers" during the winter months too. 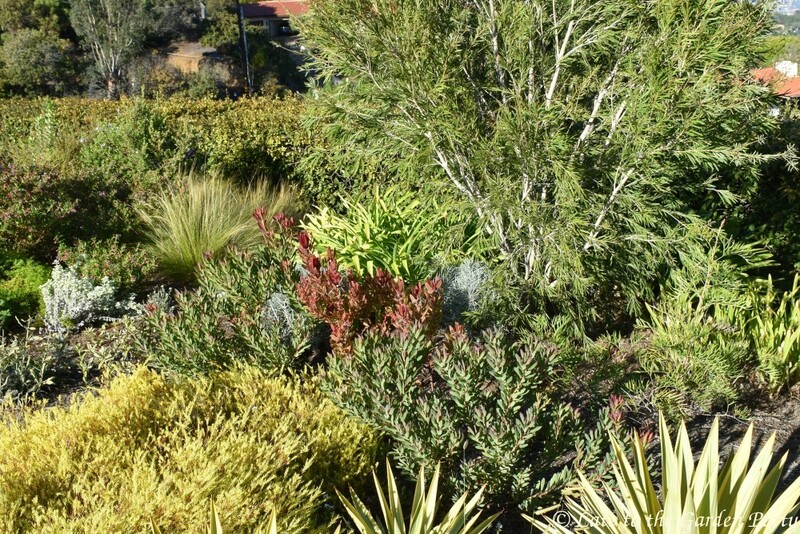 Despite its dramatically dark foliage, I almost forgot about Leuadendron 'Ebony' when I conducted my inventory. It sits next to 'Chief' but it's a significantly smaller plant and now largely obscured by the rampant growth of a Grevillea sericea. In 2014, after clearing more lawn in the back garden, Leucadendron 'Pisa', originally placed in a large pot, went into the ground. 'Pisa' has lovely silvery foliage that catches the light in all seasons. Its label said it'd grow 4-8 feet tall but, despite regular tip pruning, mine's an over-achiever. This is what it looks like in early spring (mid-February 2018 in this case), when it forms silver cones surrounded by luminescent bracts. 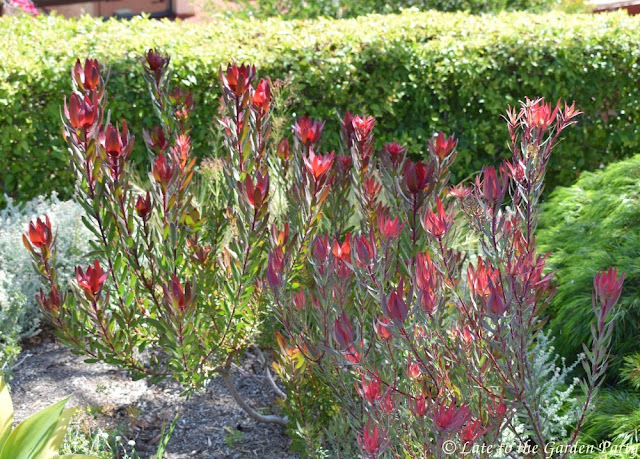 More Leucadendron have been installed at periodic intervals since then but I won't bore you with all the details. 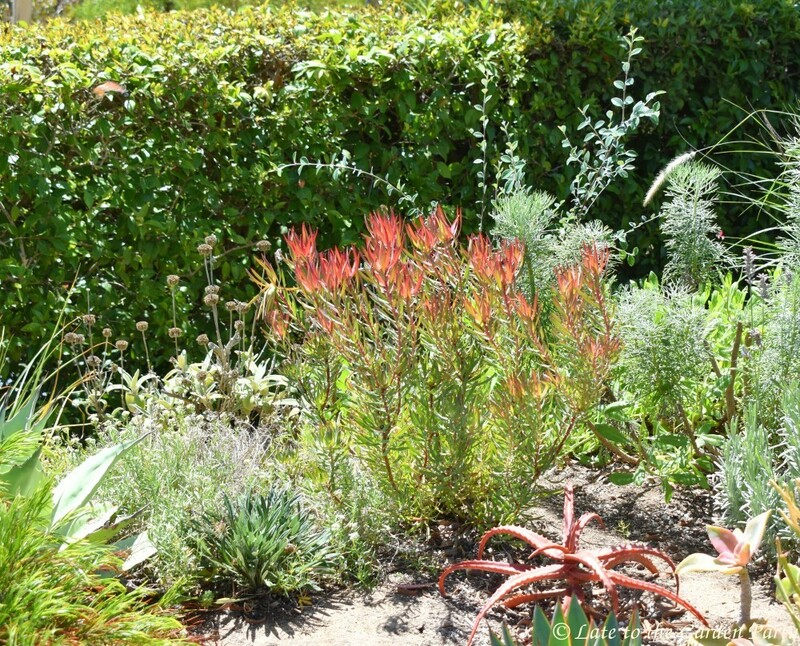 The borders in the back garden contain several of these plants. For example, there's Leucadendon 'Jester' (like 'Ebony', a sport of 'Safari Sunset') and 'Winter Red'. 'Jester' is the variegated Leucadendron' surrounded by 2 'Winter Red' specimens here. Both of my 'Jesters' have been relatively slow growers. 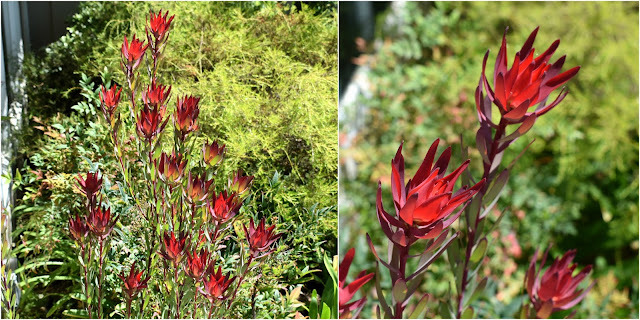 These are the same plants photographed at a different time of day. The comparison gives you an idea of low different the plants can appear when back-lit or, as here, not. 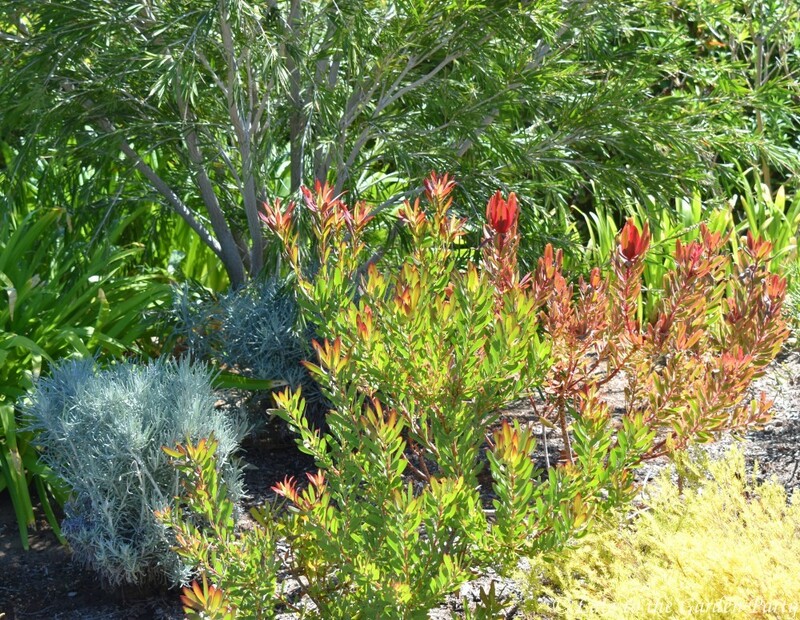 And here's Leucadendron 'Safari Sunset', planted alongside another 'Devil's Blush'. 'Safari Sunset' is on the left and 'Devil's Blush' is on the right, photographed in the morning when lit by the morning sun. 'Safari' has larger, deeper-toned "flowers" and, in time, should grow taller than 'Blush'. Two Leucadendron salignum 'Summer Red' occupy spots at opposite ends of the back garden border. As you can gather from the cultivar name, 'Summer Red' looks its best this time of year. All 3 of my plants are relatively young but this variety is among the smallest Leucadendrons I've found. 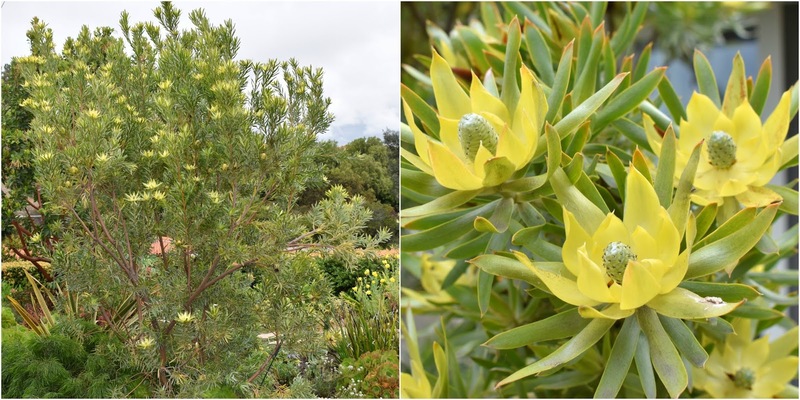 One of my most recent additions, and the last one I'll feature in this post, is Leucadendron 'Safari Goldstrike', which sits in a sunny area of the front garden facing west. That's it in the background on the left. 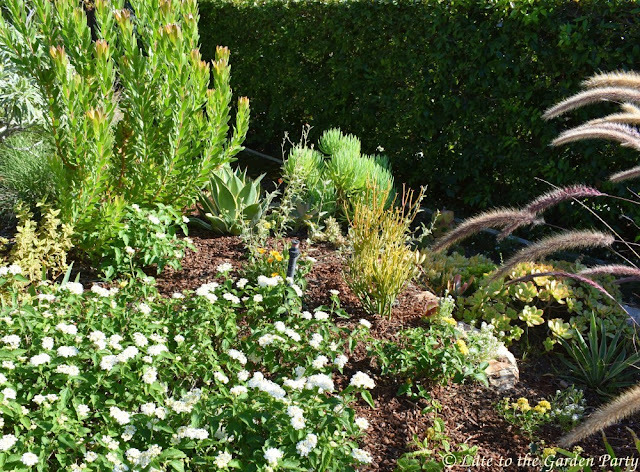 It's reportedly a compact plant that shouldn't get larger than 4-6 feet high and wide at maturity. Here's the same plant photographed back in February when it was showing off its glowing bracts. It forms huge cones. That's it. All the plants I haven't featured in photos are duplicates of specimens I've already shown. Along the way, I count 5 losses, 2 of which succumbed quickly in an area that seems to be a dead zone. Two others, 'Jubilee Crown' and 'Little Bit' were lost when I didn't provide them the water they needed to become established. The loss of 'Rising Sun' was a mystery but I speculated that it may have been exposed to a fertilizer containing the phosphorus they can't tolerate. Will I buy more? If I find space for them! At this point, I think only conquering my hideous back slope may provide that. Hello Kris, how beautiful is your collection. The first image looks beautiful. I love meeting new plants. A great collection. Your 'Pisa' is particularly magnificent. I highly recommend 'Pompom', if you ever see one, grab it. My 'Mostly Silver' died, darn it! Some of them do seem to be touchy during their early days, HB. I'll be on the look-out for 'Pom-pom'. I can only recall seeing it in a garden center once. I love them every time you show them. Ahhh, I can dream! Yes, I don't think they'd tolerate your winters and most are large to stow in a greenhouse. Something like 'Summer Red' might work in a pot if you were willing to haul it in and out of a greenhouse each year. They'd be a bit pricey to grow as annuals. Wow, are they related to Proteas? A new plant to me, I like them, too. Buy more! Yes, they're in the Protea family, Amelia. Some, like 'Pisa' and 'Chief' are very large so I can shoe-horn in only so many. Wow, you do have an impressive collection! It really likes your location--I would, too. ;-) The one placed in the foreground of the coastal view is stunning! If 'Safari Sunset' reaches the upper range of its projected height, my husband will be complaining about it blocking "his" view of the harbor but I hope I can keep it within acceptable bounds. A few weeks ago I saw a few of these offered at a local nursery and they made me think of you. Usually we only see them in cut flower arrangements in these parts. Glad you'll be buying more when space becomes available as they're gorgeous! Well, I suppose I should be pleased that there's something I can grow that you can't in the PNW but, as they're such fabulous plants, I wish you could grow them too, Peter. What a great collection. Looks like you have a great garden for them. They really do grow well here. I'm surprised I've never seen any in other gardens in my neighborhood. I’m so happy to see you growing so many. 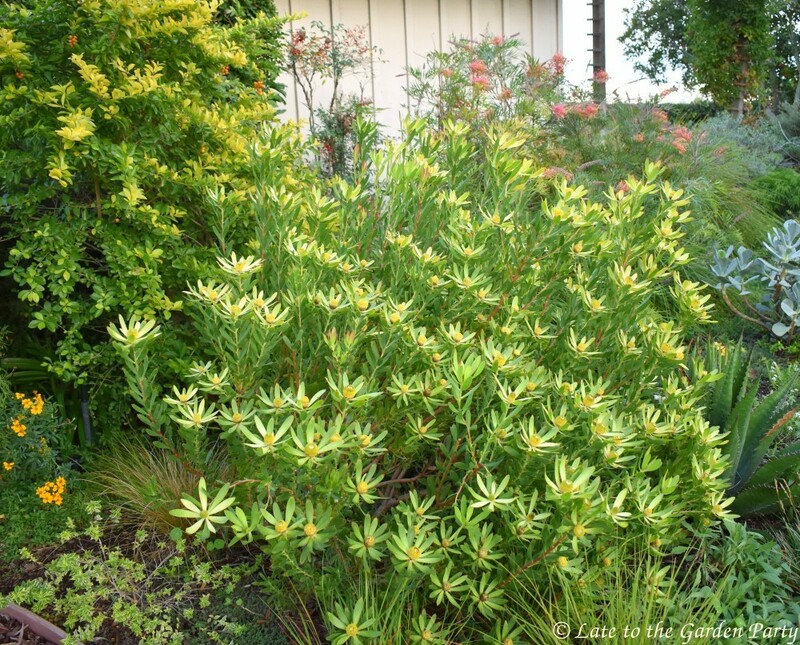 It should be a prosecutable crime to not plant Leucadendrons in your part of the world! So when you say that you cut 'Wilson's Wonder' back hard what do you mean exactly? To the ground? Do you cut all the stems? I’d love to know more. I cut 'Wilson's Wonder' down by about half after their winter "bloom" cycle, Loree, focusing on the stems with drying cones. I only cut shorter stems without cones if they're stretching into the driveway or are especially tall. I should perhaps cut deeper still as they shoot up fast but I've been afraid to. Do they then branch on the stems that you've cut? Gorgeous, everyone. I have only ever seen this growing on the island of Tresco in the Scilly Isles where it is relatively balmy. I'd love to have just one, never mind a gardenful. You lucky girl, they are fabulous. It's wonderful when I find a plant that's made for out hot, dry climate, especially when it offers 2 seasons of interest. Hello Kris, your Leucodendrons are so prolific and colourful. I had one in my front garden which I posted some months ago but it has since died for no apparent reason. It started from the top down and now it is no more. Luckily I took a few cuttings and I think one or two have taken. I’ve since planted another: hopefully it will survive. I love your Safari Sunset, such a vibrant colour. 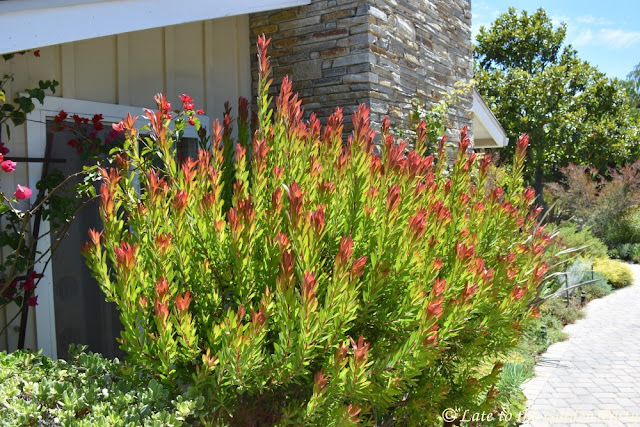 Maybe your temperatures got a bit too cold for your Leucadendron this year, Jane? As I recall, you had some incidents of frost, which is something I've never experienced here (although, with climate change, who knows what we'll have thrown at us in time). Yes, it could have been the frost, we had some very low temps. It isn’t over yet either as there’s more forecast on Monday! This climate change roller-coaster we're all riding is a pain! If I recall correctly you sometimes use these in Monday vases. Really interesting to see what they look like in place in the garden. And those glowing colors are so dramatic with all the green. Yes, Leucadendron is one of my favorite foliage fillers and sometimes I use the stems as flower substitutes too. You have a lot more plants than I thought - a great collection. I've often admired them in your arrangements. They must give you joy every time you see them backlit in the garden. There are more than I thought I had too, Eliza, especially given the average size of these plants. When I first prepared an inventory in my head, I entirely forgot about 'Ebony', 'Chief' and 'Goldstrike'. They are magnificent plants and I can understand why you have a collection. anything with such a long period of great interest and that suits your conditions just has to be a winner. I'm going to look again to see if any might grow here. 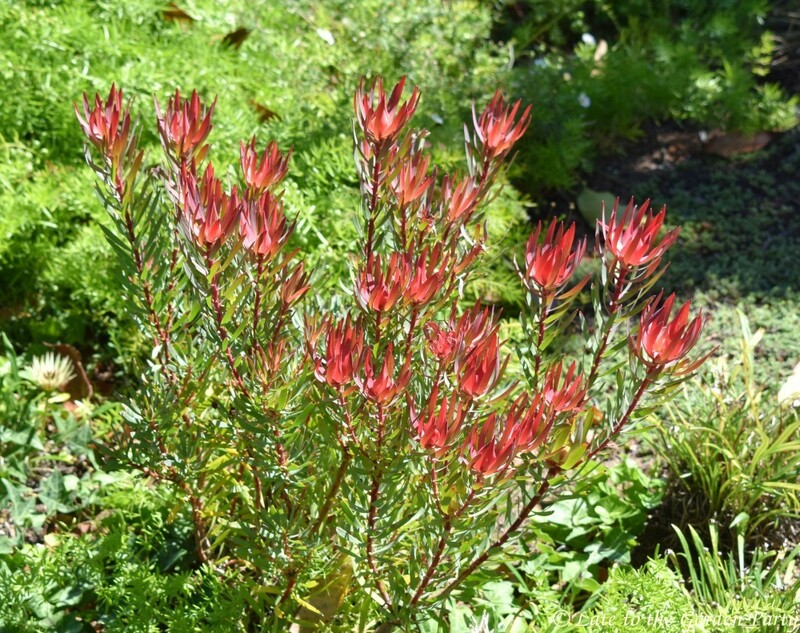 Keep in mind that Leucadendrons hail from South Africa, Christina. Your challenge is likely to be your winter temperatures. What a magnificent introduction to a plant. They obviously like your environment and look great. Thanks Lisa. It's always a joy to find a plant that's well-suited to your climate! Wow! 19. That is a collection. In England your garden might be considered to hold the National Collection. I can see what you love them. They have such great color. I think I have seen them in the cut flower section at the grocery store but I don't think they would like our humid summers. Oh, there are MANY more species and cultivars I don't have than those I do, Jenny! Love it - makes me want to skip work and go straight to the nursery. That sounds like a great plan to me, Hans! Since this post, I picked up another 'Jubilee Crown', one of the Leucadendron I previously killed. Fingers are crossed this one will be happier here. Wednesday Vignette: What's going on here?